Begin a lifetime sport, learn to bowl. You'll be glad you did! We are dedicated to providing a safe and and fun place for children of all ages to come and enjoy bowling. For the 2017 - 2018Youth season we will have USBC sanctioned youth leagues on Wednesday afternoons and Saturday mornings. In addition to youth leagues we offer less structured events for other youth groups and organizations. For more information on Youth Leagues contact Youth Director, Joy Hogan at (417)866-7246 for more information. Teams of 3 bowl Wednesday's starting at 3:30pm. $6 per child, per week includes 3 games of bowling, shoe rental, and coaching during the league. 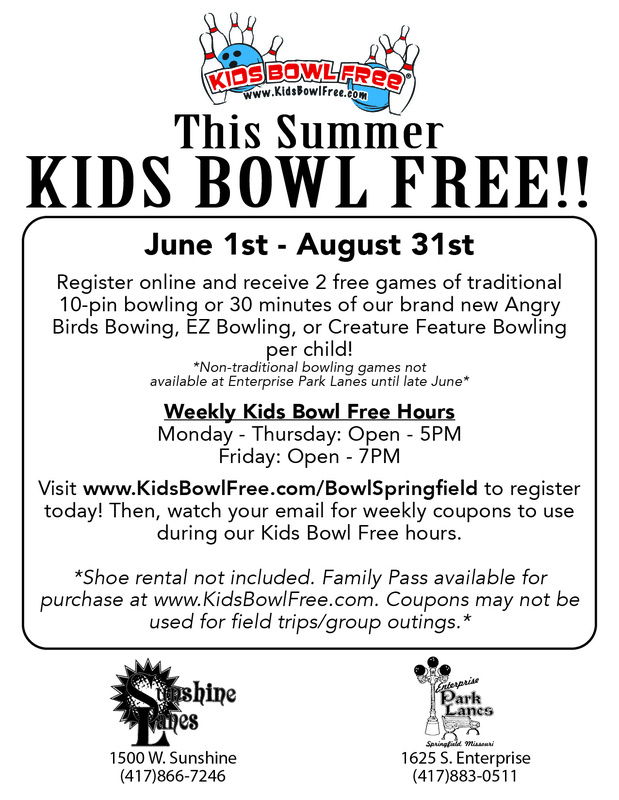 Participants ages 4-6, bowl Wednesday's starting at 3:30pm. $4 per child, per week includes two games of bowling, shoe rental, and coaching during the league. Bumper buddies is perfect for children who are just beginning bowling and looking to learn more about league play! Participants ages 4-6, bowl Saturday's starting at 9am. $4 per child, per week includes two games of bowling, shoe rental, and coaching during the league. Bumper buddies is perfect for children who are just beginning bowling and looking to learn more about league play! Participants elementary school age will bowl Saturday's starting at 9am. $6 per child, per week includes three games of bowling, shoe rental, and coaching during the league. Participants middle school age will bowl Saturday's starting at 9am. $6 per child, per week includes three games of bowling, shoe rental, and coaching during the league. Participants high school age will bowl Saturday's starting at 9am. $6 per child, per week includes three games of bowling, shoe rental, and coaching during the league.